Computer coding skills, an interactive Internet of Things project and imagining a technology future were on the curriculum at an innovation boot camp held at NSW Parliament on Wednesday 18 November. 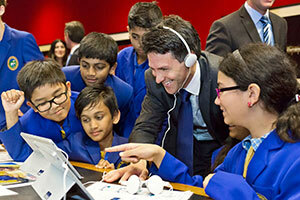 The event organised by Intel and attended by Ministers and MPs, start-ups, and students from six primary and secondary schools was the first of its kind to be held in NSW Parliament. Opening the event, the NSW Minister for Innovation and Better Regulation Victor Dominello encouraged the students to continue their digital journey, saying their skills will provide them with the knowledge and jobs needed in the information age. “The NSW Government is embracing innovation and digital disruption as the way forward in developing better solutions to our economic and social challenges, and to meet the needs of our tech savvy, connected citizens,” Mr Dominello said. Intel has developed a program on innovation in education, particularly around STEM (science, technology, engineering and maths) subjects and using technology to deepen critical thinking. This year it launched a pilot with 15 NSW schools to encourage students to create and invent their own technology with programmable Intel Galileo boards. The event featured presentations from some of the students on how they are developing their own technology solutions, including coding and 3D printed robots, to address a range of issues. The innovation boot camp was a wonderful opportunity for NSW students and organisations including MacICT, the Power of Engineering and Robogals to join with industry and show politicians the power of STEM and innovation. Intel’s Managing Director Kate Burleigh said innovation would drive the NSW economy forward over the next few decades. Katie Ford is the Corporate Affairs Manager of Intel Australia. Discover the range of Intel’s online learning resources linked to school curriculum at its education portal.